Teeth whitening. Super easy to use. Because now there's the new Whitening Pen! Thanks to the Whitening Pen from Superweiss, bleaching is becoming part of the daily routine. Low effort, massive benefits. You only need 1 minute to completely treat your teeth. The pen can be used almost anywhere, and is easy to stow away. This makes it an easy, safe and good-value alternative to complicated bleaching procedures. Bleaching makes the teeth lighter with the help of various techniques. Unfortunately, all the bleaching methods which are currently offered are either very time-consuming or relatively expensive. For example, home bleaching is a method whereby a dentist creates an individually designed plastic tooth guard for you. This has to be worn at home in several sittings (as a rule between 5 and 15) for up to eight hours. Power bleaching is quicker but costs more. Power bleaching involves a 1.5 hour treatment during which your dentist applies a whitening agent to the teeth. This agent then takes effect as it is exposed the light of so called 'bleaching lamps' for 15 to 30 minutes, and is then removed. This process is then repeated twice. For this method, you'll have relatively high costs to bargain with. The perfect solution: the innovative Whitening Pen from Superweiss! millions sold in the USA. I've been suffering from yellow teeth since I was a child and have never let myself smile properly. I recently went to the dentist to ask about having my teeth bleached or whitened. He wanted ?450. That's a lot of money for a law student in their last semester. Then, thank goodness, I came across www.superweiss.com and ordered two Superweiss pens. Fantastic! They're really easy to use. I could already tell the difference after using it just once. After 2 weeks, my teeth were whiter than they'd ever been. And all that for just ?50. My boyfriend has ordered two bleaching pens today too. Now we're both saving money! Your product works better than I had ever imagined. I gave up smoking two years ago. However, the discoloured teeth stayed. I've been using the Superweiss pen for 10 days now, and my teeth are a good 5 shades lighter. Superweiss bleaching works ? I'm delighted! 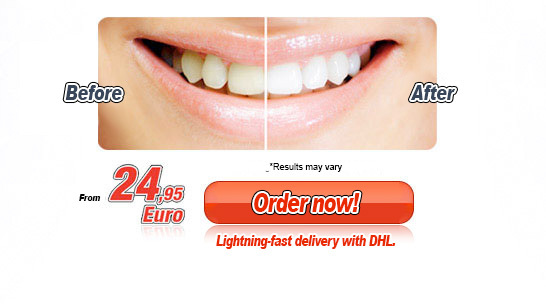 I've already tried a lot of the tooth whitening products available in the pharmacy. Unfortunately, I've not had much success. The Superweiss Bleaching Pen is the first product that has really worked well for me. I always had brown marks on my upper and lower incisors. After 7 days, these horrible marks had already noticeably faded. After less than 3 weeks I had lovely white teeth that I wasn't embarrassed show wherever I went. P.S. : Four friends of mine have already ordered the Superweiss pen from you and are very happy with it. 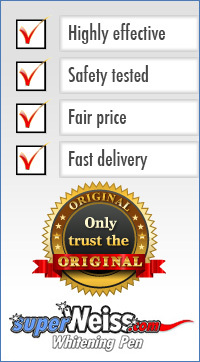 We would recommend you! Hello. Superweiss really keeps its promise. Every day I notice how my whole appearance has dramatically improved since I've seen Superweiss super white teeth when I look in the mirror. Of course I now make a much better impression on women thanks to using the bleaching pen. Thank you so much! *These are individual opinions. Results may vary.